A good bourbon cake recipe is one of those things that’s handed down from generation to generation here in the south. I found this unusual bourbon pecan pound cake in one of my early 20th century cookbooks with a hastily scrawled star next to the title in faded blue ink. It’s so buttery and moist, and it is bursting with bourbon flavor. The pecans add texture and that smooth buttery pecan flavor. I think you’ll love it as much as that long ago baker did! This post has been updated from the November 2016 original. Last updated November 2018. Few holidays in Texas aren’t celebrated with copious amounts of alcohol. This Southern bourbon cake certainly has that. 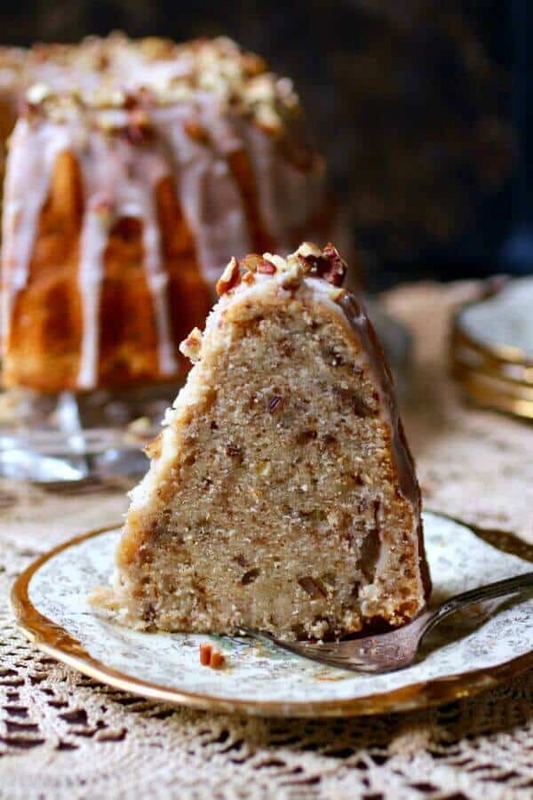 It’s a dense cake that has a strong bourbon flavor mellowed with the addition of buttery chopped pecans. Then more bourbon is poured over the warm cake, and finally a bourbon butter glaze is drizzled over the top. Be sure to get a good bourbon because that’s where all the flavor is going to come from. I use one or another that’s distilled in Texas like Garrison Brothers or Firestone & Robertson. Use something you like. My very first experience with bourbon cake was when I was about 17 and working in the Jr. Department of Joske’s. It was just before Christmas and I was invited to a Christmas party at the home of one of my co-workers. That table was laden down with all kinds of appetizers, cookies, desserts… you name it. It looked like something out of a Dicken’s novel. Right smack in the center of the table was a crystal cake dish with a bundt cake on it. It all looked scrumptious. Now, most everyone there was an adult. I started working at 14 by lying about my age. I worked from 3:30 to 11 pm after school and worked a 40 hour week. By the time I was 16 I was working full time and making a bit more than minimum wage (which was 2.25 an hour, by the way). I looked older and I think people forgot that I was so young. Anyway, back to the cake. I took the slice I was offered and sat on the fireplace, carefully balancing punch and cake on my knee. Trying very hard to look sophisticated I took a took a bite of the cake. Right then and there my sinuses cleared up, my head blew off, and my eyes probably bugged out. By the time the party was over I had sampled the cake as well as numerous rum balls and bourbon balls. You’ve just gotta love Southern hospitality. Being rather mature I decided to call my dad to pick me up rather than try to drive home myself. I decided this after I tripped off the edge of the dining area into the sunken living room and landed on my face. Honestly, I am not excessively graceful so that could have happened without the rum balls, bourbon balls, and bourbon cake but I wasn’t taking any chances. Now, most of the alcohol in the actual cake bakes out but it’s soaked in bourbon after it comes out of the oven. Then an uncooked bourbon glaze goes over the top. In other words, I would have something “kid friendly” on the menu as well. Please make it a day ahead of time – it’s just so much better. It’s good without the bourbon, if you don’t drink. Just substitute a good, spicy ginger beer or ginger ale for the bourbon if you don’t imbibe. Apple cider will work, too. This bourbon cake tastes better the second or third day so it’s great to make ahead! To store, wrap tightly and store at room temperature. It freezes well for up to 3 months. I love this bundt pan by Nordic Ware. It’s simple and elegant – perfect for any occasion. Nordic Ware produces heavy bakeware that lasts just about forever. It’s my pick as far as manufacturers go – and they have some fabulous designs. This is just one of them. 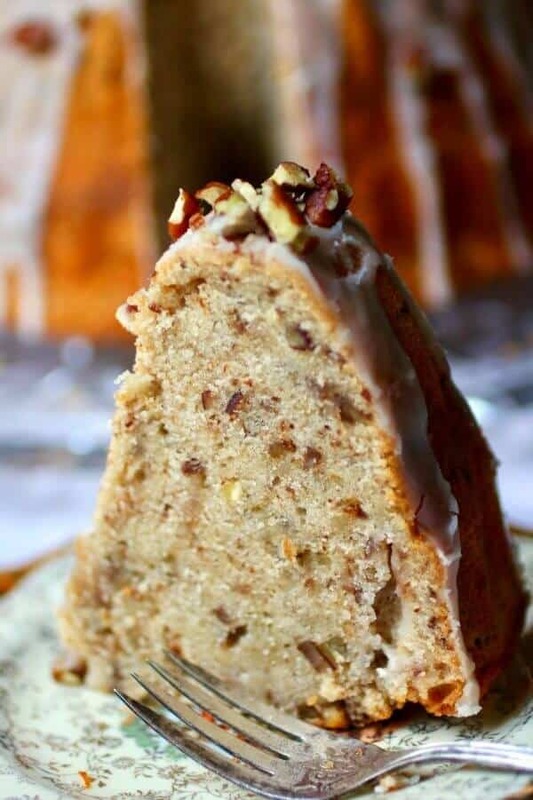 This bourbon pecan pound cake is SO good. I just love it… but here are some more of my favorites! Christmas Fruitcake – I know… but this one really is amazing – sweet and sticky like candy. You may also like this yummy brown sugar version from King Arthur Flour. Here’s that easy bourbon cake recipe! Remember to use a good bourbon and let it sit at least overnight. If you love this recipe please give it 5 stars. 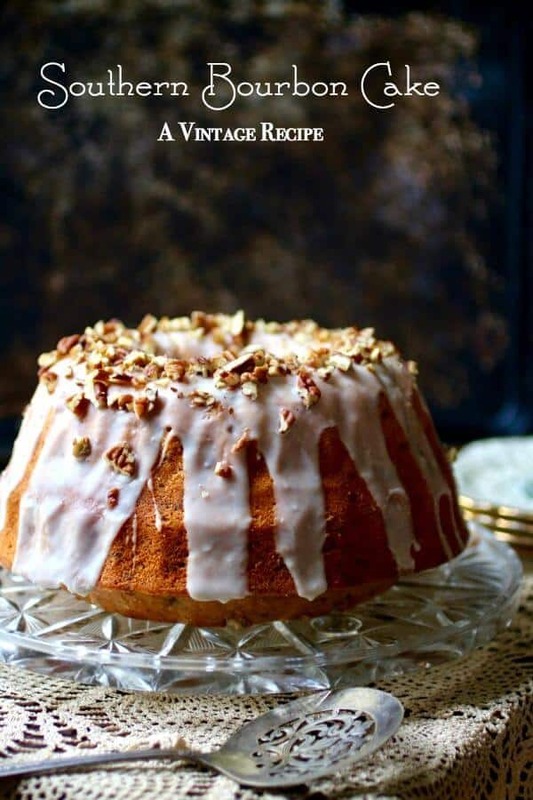 Homemade bourbon cake recipe from a vintage cookbook. This easy recipe is about as Southern as you can get! Pecans add a buttery richness to the moist bundt cake and top the sweet bourbon glaze. Soaked in bourbon, too! The baking technique is what makes it so good. Have all ingredients at room temperature before beginning. Grease a bundt pan and add about 1/4 cup sugar. Move the bundt pan around and gently shake until the sugar coats the pan. Pour out any excess sugar. Cream the butter and 2 cups of sugar together until light and fluffy. Beat in 1/2 cup of the bourbon. Blend the flour, cinnamon, baking powder, salt, and nutmeg together. Add to the creamed mixture a little at a time. Stir in the remaining 1/4 cup bourbon and pecans. Bake at 325F for 1 hour 40 minutes or until a toothpick inserted halfway between the side and the center has just one or two crumbs attached to it. While still hot pour the 3 tablespoons of bourbon over the cake along the outside edge. Add the Confectioner's sugar to a bowl. Stir in the melted butter until well blended. Add enough bourbon to make a thick glaze. Spoon the glaze over the cooled cake and sprinkle with more chopped pecans. This recipe is part of Meal Plan Monday – head on over there and check out all the great recipe ideas! Would this be as good with rum or rum extract? After combing through numerous recipes, I chose this because of ease. Wow just came out of the oven 😍… Awesome flavor. This is definitely a keeper. TY! Ran out to buy more bourbon while cake was baking. Cashier asked what I was making so I told him. If there’s any left over after I take it work tomorrow, I promised him a slice. Wow! Just walked back into the house and my kitchen smells like heaven! Im a novice baker so I’m hoping for a great cake. Thx for sharing your recipe. BYW, I rated this five stars based on aroma. This cake was very good! I have made a bourbon and praline cake before, and my husband loved it but we felt it didn’t have enough bourbon in it. This one did the trick, and my hubby proclaimed it to be excellent! The only thing I had to do a little differently was add more bourbon to the glaze (poor me…haha), because mine was a little thick. I actually added an extra tablespoon of butter and about 3-4 T of bourbon, but it was delicious! Thank you for sharing! Molly! I am so glad you liked it! I think next time I make it I’ll try more bourbon! Wow… less than 5 mins after I posted my comment, I had an email from Marye, and within the email was a copy of the recipe… THANK YOU MARYE; You saved me; YOU ARE A GODDESS!! Awww thank you. I was happy to help. Would love to try this recipe but can’t get it to print. Can anyone help with recipe, please? Thanks! Ken – there was a technical glitch but I PROMISE You it’s being worked on right now! 🙂 SHould be back up tomorrow or the next day..and because you need it..Im emailing it to you.. Thanks for reading!! I am a little confused by the directions – specifically # `8 which says add 3/4 cup bourbon (which is all that is called for) and then in # 11 which says to add the rest of the bourbon ? The only other bourbon that is called for is the 3 tablespoon to pour on after it bakes. Was the bourbon supposed to be added alternately with the flour? HELP! That was a typo on my part. Sorry. It’s 1/2 cup bourbon in the first instruction then 1/4 cup with the pecans – but honestly it will be fine either way. Thank you. Yes, it was fine, but I was expecting it to be a more moist cake. It seemed a little dry to us, but we did love the flavor. What size of bundt pan for this recipe? I️ bought one (Nordic Bavaria as shown) but it seems small for any recipe! Not a mini, but hold 10 cups of water almost to top of rim. Is this the right size for this cake?!!! My husband loves bourbon and desserts. Today is his birthday and I found your recipe. I used my mini bundt pans and I got 24 cakes and they baked for 19 minutes. My son and I taste tested one and it was wonderful! Can’t wait for my husband to get home and have one. Looking forward to tomorrow to see how the flavor develops. Thanks for the recipe! Definitely will be baking them again! I think it could? I’ve never tried. Hi Marye! My name is “Mary E” 😉 and I am also from North Texas ..McKinney. Would this recipe work well in mini-bundt or -loaf pans? How long should they bake? I’d like to make them for coworkers. I can’t tell you how much I love McKinney! The restaurants in the historic downtown are top notch! Yes you can make it in either min loaf or bundt pans. I’d start checking it after 15 minutes? I’d guess 20 minutes will be the “clean toothpick” point. Have a great day! Sounds like you were just about as graceful as I was as a teen – I was always falling everywhere – and have the scares to prove it! btw, You sure were a hard working teen! Now, onto this gorgeous cake – I’ve had a rum butter cake before but never a bourbon one – yours is stunning! A slice would be intoxicatingly deeeelicious! You had me at pecans…and bourbon! ? 🙂 It’s such a great combo!